I entered the seminary after attending East Stroudsburg University for two years. From as early as I can remember, being a priest was always something that I thought was a possibility. After much prayer and discernment, I entered St. Charles Borromeo Seminary because I believed that God was calling me to serve the Church and his people as a priest. My family and friends are the most important people I have in my life. Each member of my family has supported and encouraged me in my vocation in their own particular way. My mother, father, sister and grandparents have inspired me to continue on my journey toward the priesthood. My extended family and friends from high school have also been a great support. Finally, I would be remiss not to mention my brother seminarians. They have been both a great support and inspiration for me during my time in the seminary. There are a few things that I enjoy doing in my free time. I have recently picked up two new hobbies which I really enjoy: skiing in the winter months and playing golf in the warmer months. I also enjoy cooking and spending time with my family and friends. I have always enjoyed being outdoors, so when I have the chance I still like to go hiking and camping. The life of a seminarian is hard to explain in a few sentences. We begin each day with Morning Prayer and Mass followed by class. In the afternoon we have time to work out, work on assignments and get involved with different groups/clubs at the seminary. We gather each day before dinner to pray Evening Prayer. While praying is not the only thing that we do in a day’s time, it is the most important. Being a seminarian means being in daily conversation with God. The “community” aspect of the seminary is one of the greatest aspects of seminary life. There is a deep bond of friendship and fraternity that is fostered through our daily prayer and interactions with one another. I am unbelievably grateful for my brothers here at St. Charles Borromeo Seminary. I have made great friends, many of whom I would have never met had I not entered the seminary. I thank God for my seminary experience up to this point and can’t wait to see the great plans that God has in store for me and my brother seminarians. 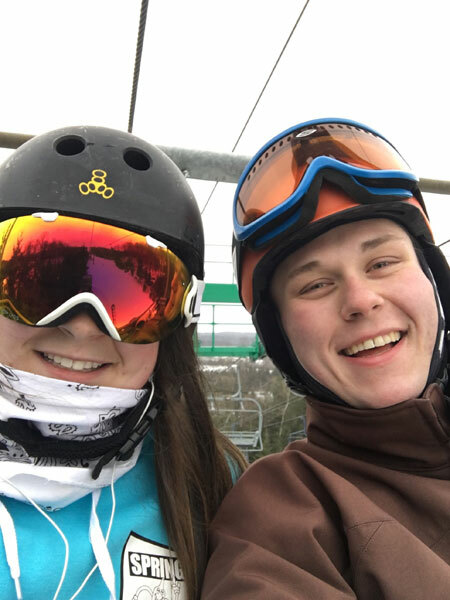 Zachary Wehr, right, diocesan seminarian, spends time with his sister, Emily, during a ski trip.